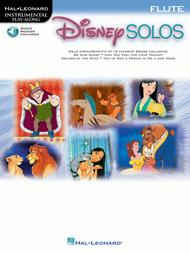 Disney Solos - Flute (for Flute). Composed by Various. For Flute (Flute). Instrumental Folio. 12 Disney favorites with a CD that lets you play along with a full band. Disney, Movies and Play Along. Difficulty: medium. Instrumental solo book and accompaniment CD. 24 pages. Published by Hal Leonard (HL.841404).ISBN 0634000675. Disney, Movies and Play Along. 9x12 inches.Features 12 Disney favorites with a great CD that lets you play along with a full band! Songs include: Be Our Guest • Can You Feel the Love Tonight • Colors of the Wind • Friend like Me • Part of Your World • Under the Sea • You'll Be in My Heart • You've Got a Friend in Me • Zero to Hero • and more.